Longtime Lake Lucinda resident Bill Vogel, right, a wildlife biologist with the U.S. Fish and Wildlife Service, chats with Darlin Creek stewards Bonnie Liberty, left, and Terry Liberty at Darlin Creek June 21 to celebrate the Capitol Land Trust's acquisition of property around Lake Lucinda. Photo credit: Paul Dunn. Bill Vogel can still feel the weight on his shoulders, even 20 years later. It’s been that long since his son Karl rode atop his shoulders, the two wandering the forests and wetlands adjacent their Lake Lucinda home much as the first explorers to see it might have. To Vogel it seems like just yesterday — the common refrain from parents whose kids seemingly sprout from infant to adult in an instant. Longtime Lake Lucinda resident Bill Vogel, right, a wildlife biologist with the U.S. Fish and Wildlife Service, chats with Darlin Creek stewards Bonnie Liberty, left, and Terry Liberty at Darlin Creek June 21 to celebrate the Capitol Land Trust’s acquisition of property around Lake Lucinda. Photo credit: Paul Dunn. Though Karl — now 24 and a mechanical engineering student at Washington State University — is now a bit too large to ride on Dad’s shoulders (“I don’t want him to ride up there anymore,” Dad says), he still periodically re-explores those forests and wetlands near his parents’ home and graciously takes his father along for the stroll. He was there with his father, in fact, on June 21 to help celebrate a Lake Lucinda community milestone that will benefit nature lovers near and far. 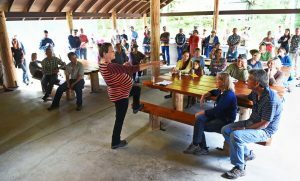 It was on that afternoon that Capitol Land Trust Executive Director Amanda Reed greeted the Vogels and about 65 other people to Lake Lucinda community park to herald a new era 15 years in the making. About three weeks before, the Trust — a non-profit organization established in 1987 to conserve essential natural areas in southwest Washington — had closed the sale on 312 acres of Olympia-area property in the Black River Watershed. The Darlin Creek property, which lies between Capitol State Forest and the Black River Wildlife Refuge, includes Lake Lucinda, Darlin Creek, several beaver ponds, wetlands and forests. 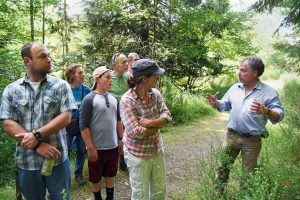 The Vogels spent several hours that afternoon leading guests on a hike through the Capitol Land Trust property, a bounty of natural diversity just off the old logging roads that wind through the property. Reed, who worked previously for The Nature Conservancy in Arlington, Va., noted that Capitol Land Trust had been working with the Conservancy for about 15 years to identify critical areas to conserve within the watershed. The Darlin Creek property seemed like a logical site to pursue. Amanda Reed, executive director of the Capitol Land Trust, greets visitors on June 21 to Lake Lucinda commmunity park to celebrate the Land Trust’s acquisition of property surrounding nearby Darlin Creek. Photo credit: Paul Dunn. 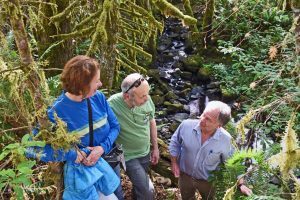 “The Darlin Creek property stood out because of its size,” Reed explained, noting it was among a rare few with that much acreage under a single owner in the Black River Watershed, an important tributary to the Chehalis River. Other factors influenced the decision to pursue the property, too: the health of the forest and water resources on the property, the presence of wetlands, and because Darlin, Dempsey and Pants creeks – important headwater tributaries of the Black River and Chehalis River — flow through the property. But acquiring the land proved challenging. Aloha Lumber Company of Aloha, Wash., owned the property and was planning to build a 45-home subdivision on the site unless the Trust could come up with the company’s selling price: $1.6 million for the property, with additional money needed for legal fees and restoration work that pushed the total cost to $2 million. Once the Conservancy and Trust identified the Darlin Creek site it took about a decade for the non-profit organizations to raise enough money to buy the land. 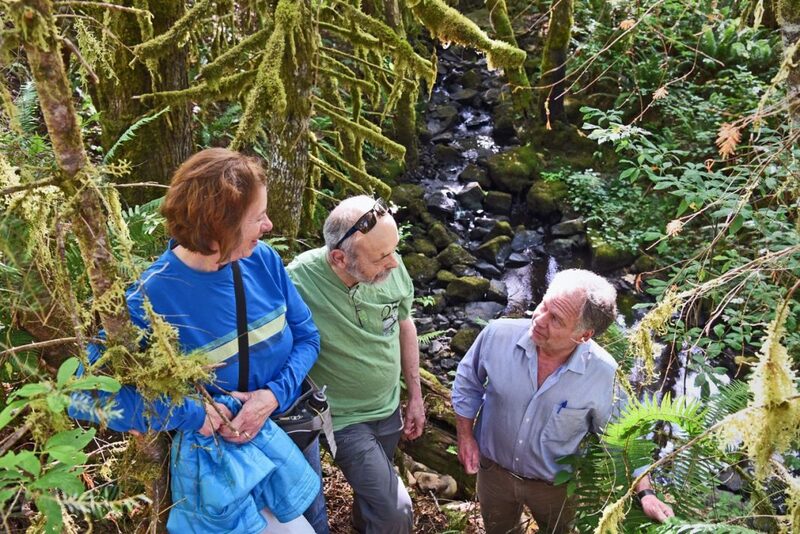 Lake Lucinda resident Bill Vogel, right, leads a tour June 21 around Lake Lucinda/Darlin Creek to help celebrate the Capitol Land Trust’s acquisition of the 312-acre property in Olympia. Photo credit: Paul Dunn. 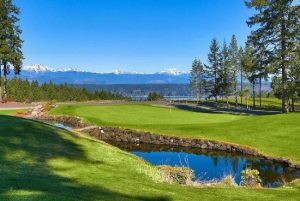 Passage of the Washington State Legislature’s $11 million Washington Coast Restoration Initiative — a new funding source focused on salmon restoration envisioned by The Nature Conservancy and developed by a coalition of partners — and Aloha’s willingness to reduce its asking price finally turned the trick. For Vogel, a wildlife biologist with the U.S. Fish and Wildlife Service, the acquisition is a monumental milestone for the property he knows like the back of his hand. He credits Aloha Lumber, its parent company Oregon-based Obsidian Finance Group and Capitol Land Trust for the agreement. On this celebration day, Vogel, 55, was himself patient as he led a group of about 10 hearty souls on a two-hour hike through the property, passing Lake Lucinda, Darlin Creek, beaver ponds and forests with species of sprouting greens too numerous to name. 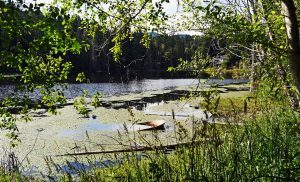 A mostly submerged row boat anchors the shoreline of Lake Lucinda in Olympia June 21 during a celebration of the Capitol Land Trust’s acquisition of property around the lake and nearby Darlin Creek. Photo credit: Paul Dunn. And he’ll be close by, no doubt, this summer when professional engineers and wetlands experts remove a perched culvert blocking coho and cutthroat from passing on Darlin Creek and build a bridge in its place. Plans also include developing about three miles of trails through the property and constructing limited amenities, though these projects won’t begin until the Trust receives sufficient public input. 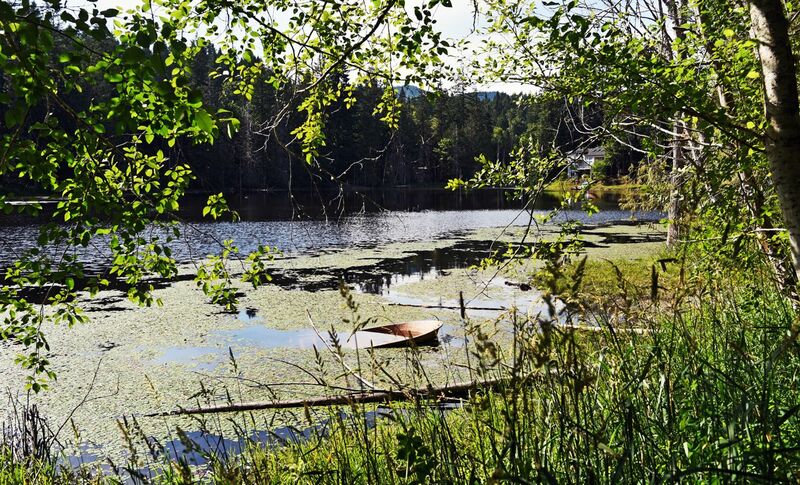 The same can be said for Olympia residents Bonnie and Terry Liberty, who live a few minutes from Lake Lucinda and visit the property about 20 times a year. As newly named stewards of the Darlin Creek preserve, they’ll guard the land like new parents. Bonnie’s husband Terry spends time on the property getting in his usual two to three mile walks most days. 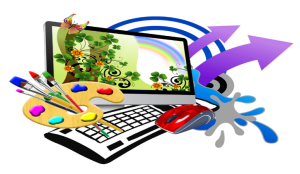 “I really enjoy crossing Darlin Creek and getting to see the beaver dam and the wetland area,” said Terry, a retired computer programmer who finished his career with the state Office of Financial Management. Like Bonnie, Terry contemplates overseeing the property and reporting vandalism and other problems. To bolster his reports, he plans to photograph up to 50 different spots in the area. And who knows, maybe his camera will catch the occasional black bear, or cougar, or coho salmon — or any number of other species that call the Darlin Creek property home. It’s a bio-diverse connection well worth developing, Bonnie said. 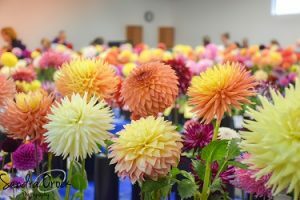 “I believe that health is connected to the great outdoors, and the more we can connect with nature and people, the better we’ll be,” she concluded. To learn how you can be involved in projects like this that help with salmon recovery within the Chehalis River watershed, visit the Chehalis Basin Lead Entity website.